There are more signs of Spring in evidence even though our mild January has turned into a pretty frosty February -10c with wind chill factors. Don't put those needles down yet. There's plenty of time to wear out a mitten or two. Still Orion is in the Southern (oh, how I love that word) sky - at least I think he is. 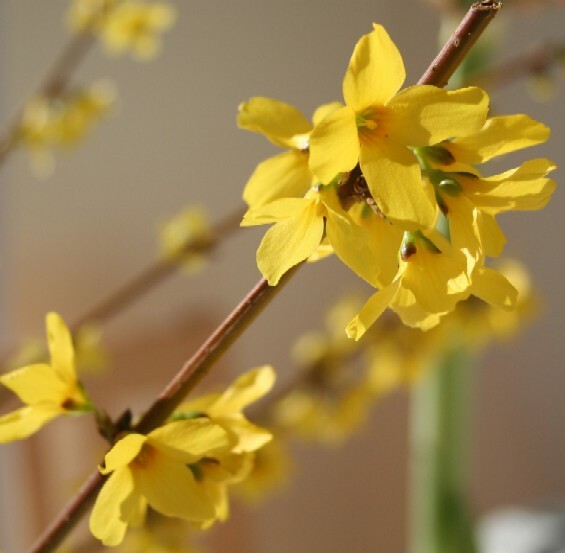 It's been so cloudy that I haven't seen a star in days - and the Forsythia brought in for forcing is now in "forced" bloom. Actually very lovely blooms of sunny yellow to get us another week closer to the real stuff. I love bringing in branches of blossoms to have them bloom early in doors. It's just the term "forcing" that makes me think of medieval torture chambers! I know I should really be thinking of that rejuvenating force that brings everything back to life. That wonderful creative force that brings us the sublime in Art and Nature. How could I not think of it - look at those flowers! I promised details of the winner in my Robert Burns post. I had quoted a line from a poem to sum up the poetry of Robert Burns and yes my struggles with finding samples I had knit ages ago. The quote was from a poem that described a highland lass singing and the poet suggests that she is singing of - "old forgotten far off things and battles long ago". My mind substituted "forgotten" for "unhappy", maybe I have forgotten all those unhappy things - well maybe not all of them. Anyway Ginny posted - It's "The Solitary Reaper" by William Wordsworth. "I Wandered Lonely as a Cloud" is in my son's rhyme treasury, and I've rediscovered my appreciation for Wordsworth. 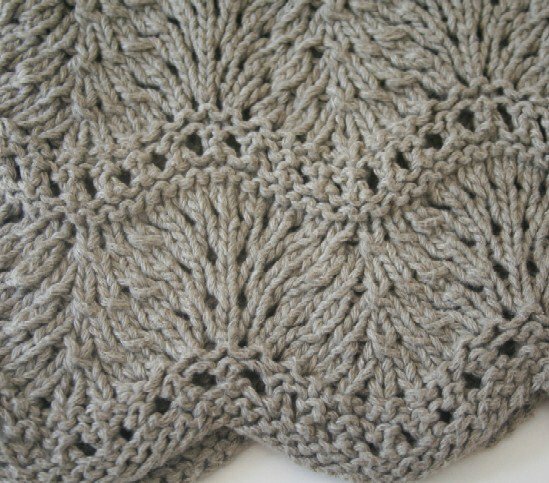 I just recently stumbled across your website through the knitting blogs ring, and I really appreciate your connection between knitting and creativity. I only started knitting in November and blogging just after that. It's amazing how I've also been inspired by the yarn and the needles. Thanks so much for putting your thoughts and creativity out there on your blog. I hope you see it return to you three fold. Thank you Ginny - that's what it's all about - cast your words, your work, your thoughts upon the waters, waves or - something - of the world - throw caution to the winds, create beyond your wildest dreams and you will have moved yourself, if not others a little closer to the sublime - I hope! Anyway here is the poem - thank you again, Ginny, for knowing the title and the author! 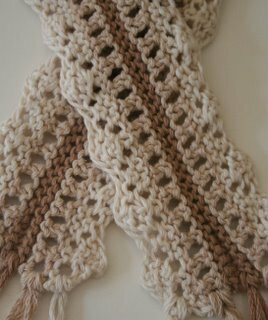 Also, Ginny, please send me your address - info@infiknit.com - so I can send you the skeins of organic cotton! I am saving the other poem you mentioned for March. The knitting pictures are samples in organic cotton - colours of the earth - shades of a more pastoral age. P.S. 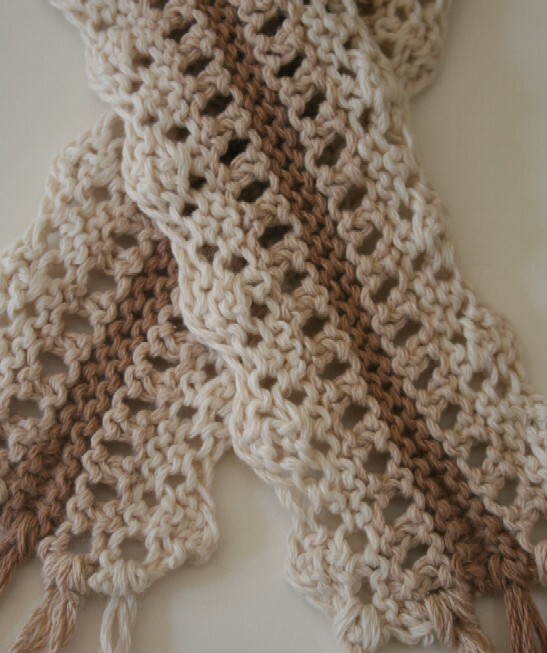 There are still 2 skeins of organic cotton to be won!